After creating the post about Prenatal Yoga poses, my students keep asking for a similar post with the yoga moves that we typically do in the mom and baby yoga class. So finally here it is. A lot of the stretches we do with the babies, have movement in them, since little ones like to move and groove. Therefore I needed to take a LOT of photos to show that. Class always starts with a little bit of centering. Hold your baby and breath and just notice how you are doing : physically, mentally and emotional. Start by connecting with yourself and baby. Then warm up – stretch yourself out a little and baby too! Here is a great baby warm up movement – we call it “Toes to Nose”. If baby is strong enough to hold up their own head – “Up We GO” is lots of fun. And don’t forget to fly. 🙂 Note: this is best done a while after baby has eaten. I got burped on once when my daughter was a baby, and learned that lesson. Despite the dangers of getting burped on – BABIES LOVE THIS. So fun. Now it’s time to really stretch you out with a modified Sun Salutation. Start in Prayer posture and then stretch up. Exhale and forward fold and reach down to tickle your baby’s feet. This is a fun way to make baby giggle. And personally there is nothing better than baby giggles. Next step one foot back into a lunge, drop your hips and feel that great stretch. Then step the other foot back so that you are in plank position. This posture is really good for developing the core muscles which are generally still somewhat weaken from the pregnancy. Next add a little bit of upward facing dog and downward facing dog to really create some space in your back. To finish the sun salutation, move through the sequence in reverse. Go into plank, then lunge (make sure to alternate sides), forward fold and then back up to standing, and finishing with prayer position. Doing between 3 – 5 sun salutations is a great way to warm up your body and are really nice to do a morning stretch routine. 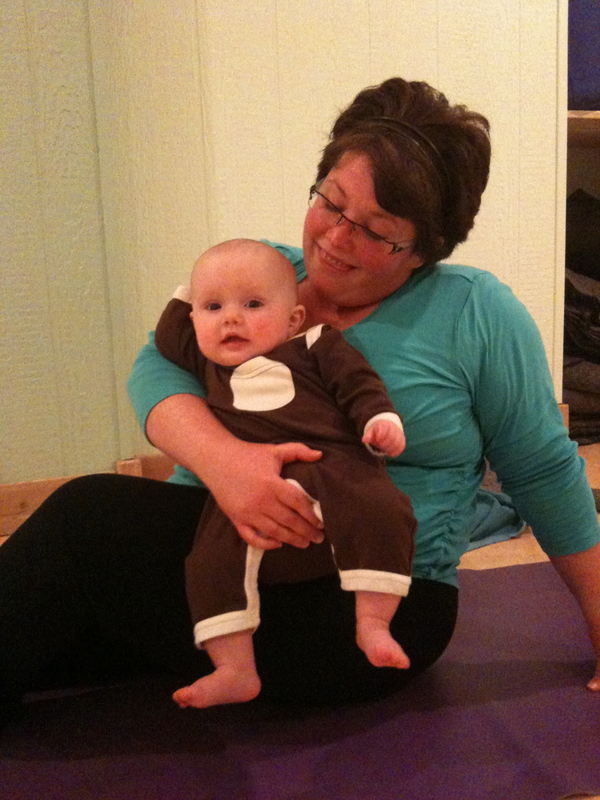 Standing postures can be a great way to interact with your baby while at the same time rebuilding your strength. The best way to pick baby up is to drop your bum, squat down and pick up your little one. This protects your back from strain and strengthens your buttocks, and abdominal muscles. Tree posture is great for the core and easily done with baby. Use whatever holding position your baby prefers. After, knock it up a notch by adding a few leg lifts at the end. Standing twists with an airplane swing is a big hit. You get a nice stretch and babies love it. This is my go to post if some of the babies start crying and nine times out of ten, they settle down and enjoy it. Squats : so great for you in so many ways. In addition to stretghtening the core, squats always stretghen the buttock muscles while elongating the pelvic floor. Squats in conjunction with pelvic floor exercises (or Kegels) are the key to a happy healthy pelvic floor. So if you find you are still peeing when you sneeze – this one is for you. Squatting and then standing up with baby always add the weight of baby’s body to the exercise and increases it’s intensity. After the standing poses, it’s time to move down to the mat for some seated postures. This is a great way. It’s legs up the wall (or the invisible wall as I like to call it) and then use baby as weight. They love it and you get a great upper body work out. Next drop your feet, keep your knees bended and let your knee drop from left to right for a nice gentle lower back twist. Kegel Time! Find a comfortable seated position and work those pelvic floor muscles. This is an ideal exercise to do when you are nursing or bottle feeding baby. This next one is excellent for stretching out those tight pectoral muscles. Generally the pectoral muscles get shorter with the birth of a baby because of all the holding that you do in a day. So it’s really really important to lengthen these chest muscles daily otherwise your upper back muscles may become over-extended and sore. If you don’t have a bloster at home, roll a blanket into an oval type share and use that. Baby can hang out between your legs. It’s nice to finish the mat poses with a good seated twist. Bring baby with you by holding or sitting baby down beside you as you twist. In class we then do infant message with the baby… but that’s a topic for a whole new post. In the meantime, check this article about the benefits of message for babies and if you want to come and try it, download a coupon for a free class here. After the message, we finish with Savasana or Relaxation. Over the years, I’ve adapted this. I now call it cuddle time. I turn down the lights and put on a nice lullaby and everyone cuddles their baby. Sometimes this means standing and rocking, sometimes it means sitting and holding or feeding baby, and sometimes it means laying down next to baby and cuddling. Whatever position you find yourself in, enjoy it. And finish with a kiss. Namaste! ps. BIG BIG thank you goes out to Michelle and Oscar for being the models for this post. If you liked reading this article, you might also enjoy these two posts. 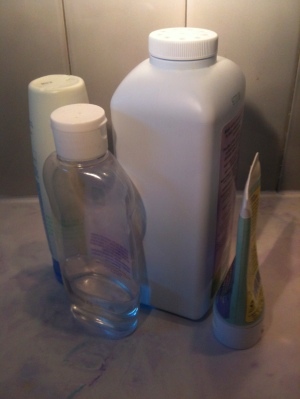 What kinds of products are you using with your baby? Are they safe as they could be? ← Are you ready for baby?